Happy Easter from the ISS! Kelly: "The ride to orbit was impressive, as it always is...once I get aboard the space station, it felt like I was visiting an old home - felt very comfortable - but there is a lot of work to be done here, and the pace of work at times can be hectic...we were supposed to have the weekend off, but we really spent those two days moving in, so we've basically been working since we got here." Kornienko: "The time flies a little slower here, but as far as our psychological compatibility, we have been working really hard on the ground to work that out, and we have lots and lots of support, and our psychological success is a given. I am very sure about our success, and I'm sure that we will not have even a modicum of any psychological issues." Kelly: "Right now I'm just kinda taking it day by day...I'm looking a little bit towards the next major event...I'm just trying to take it day by day, pace myself...keeping my energy level up...a good/life work balance is important, and that's even more important on the space station." 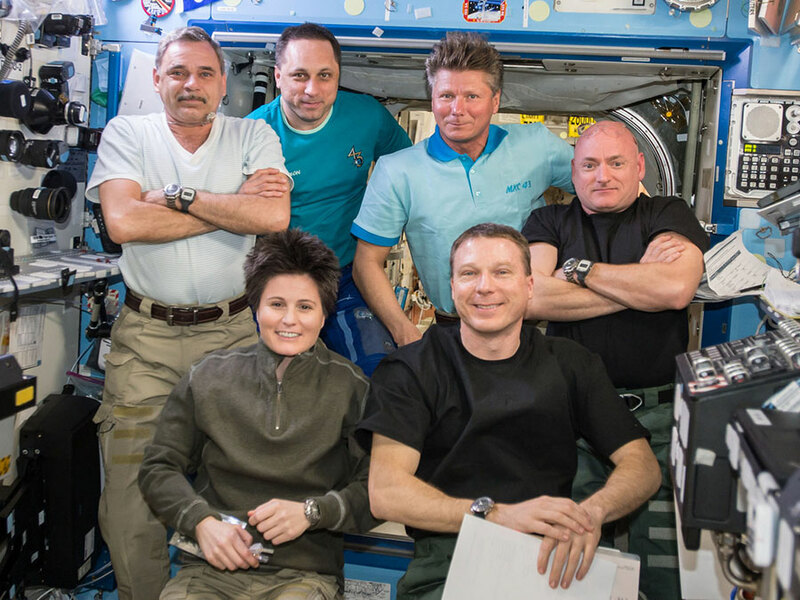 Kelly: "We're all been doing great work up here, we're one big team...it's more than just Misha and I...the international partnership, in my mind, is one of the high points of this international space station." The full video is available below, or in high-def here. The signoff-backflip is our favorite part. Meanwhile, on Monday April 13th, a SpaceX Dragon capsule will fly to the ISS aboard a Falcon 9 rocket, launching from Cape Canaveral, Florida. The launch is slated for 4:33PM EST and will be covered by NASA TV starting at 3:30. The capsule will arrive at the ISS next Wednesday, where ESA astronaut Samantha Cristoforetti and NASA astronaut Terry Virts will use the Canadarm robotic mechanism to "grapple" the Dragon for docking. This mission will be the sixth SpaceX commerical resupply venture, and the seventh that features a Dragon capsule. The Dragon will bear 4,300 pounds of equipment and supplies to the ISS, where it will reside for five weeks before being reloaded with experiments and other material to be safely sent home. Until then, the crew have been participating in their usual array of experiments, including orientation for the new crew and training in emergency medical procedures (during which Kelly quipped on his Facebook, "Maybe the one thing you don’t mind your crew mates being better than you at.") Kelly also provided saliva samples for initial data in the groundbreaking Twins Study that he and his Earthbound twin brother Scott are participating in. The crew also set up materials for a rodent research study and gathered data for a study that focuses on ocular health in space. Looking sharp, spacefarers! Keep up the good work! As part of the space-based monitoring of Earthly weather conditions, some stunning images were captured of last week's Supertyphoon Maysak. The storm, which broke over the Philippines and reached Category 5 hurricane status, was watched over by the Tropical Rainfall Measuring Mission (TRMM) and Global Precipitation Measurement (GPM) satellites, which are co-managed by NASA and the Japan Aerospace Exploration Agency (JAXA.) The satellites indicated that the Maysak reached wind speeds of 85 knots (98 m.p.h.) and had rainfall of up to 2 inches per hour. More images and video of Maysak, as seen from the ISS, are available here at mashable.com. That's all for this week, space fans! Tune in next time for all the best news offplanet has to offer! Watch this space! Earth: sometimes even scarier than living in space.